What do sustainability and purpose have in common? Everything. Yet brands and businesses are missing the link. A recent MSL-hosted event in London helped connect key dots. With consumer trust in brands and business in a slump, the public is demanding proof of sustainability, purpose, and genuine business transformation from organizations. Clearly the big question remains: How do brands and companies shift the dial from one-off purpose-driven campaigns to using purpose to drive business transformation that will propel progress, participation, and innovation? Purpose isn’t achieved with bolt-on social marketing or cause-related initiatives. Instead, society expects organizations to behave coherently and credibly across all areas of operations, behaviors, and communications. Many businesses are simply failing to leverage their sustainability strategy and actions as the ultimate proof of purpose. Clearly, communications and sustainability strategy must be better connected to the business. Marketing campaigns shouldn’t be one-offs, but rather tie more closely to the heart of sustainable business strategy. This is where a joint approach can unite multiple sides of the business to provide unique insight and credible purpose. This leads to the following oft-asked question: "Where do you start with purpose if you’re not born with it?" As such, the starting point for a credible purpose is to identify your most relevant issues. To be credible, your sustainability ambitions and purpose need to go hand in hand. You need to understand the societal need through expert insight before you dive in head first. That is absolutely key to building a robust foundation. This equally applies to what happens in the supply chain, to how a business is rated as an employer, to how consistently these values are expressed through the products you offer. Only those businesses living their purpose authentically through their internal culture and bringing it to life within corporate behaviors unlock the full value of their purpose. •Step 2: Walk the talk. Credibility comes from doing, not saying. We work with a simple framework that looks at how you need to "live" your purpose across behaviors in these five key areas: leadership, operations, supply chain, employee, and brand and creative. 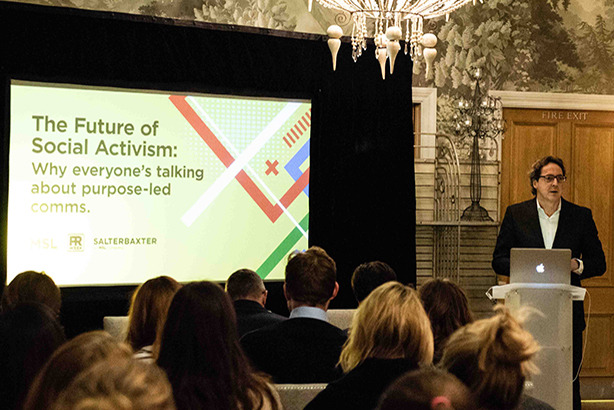 At our recent "Future of Social Activism" event, held in London, Katie Leggett, sustainability manager at Innocent Drinks, offered a solid blueprint during her presentation. "We defined our purpose," she explained. "It’s core to everything we do and all the decisions we make. But we don’t communicate our purpose. We simply leverage all the good things that come out of being true to our purpose." This takes on added relevance when you consider that many perceive Innocent Drinks to be a leading purpose brand. •Step 3: Value progress, not perfection. We seem to have missed the point on purpose. In making purpose about having a great campaign, and seeing many getting it wrong, brands have developed an expectation that purpose needs to be perfect. What it needs to be is right and credible. Stakeholders today are demanding honest and transparent progress over perfection. True leadership is admitting you are at the start of your journey and keen to change your ways. For a purpose genuinely to deliver societal good, it must be industry-changing. That’s not something that can be achieved overnight, nor by one company alone. True leadership and radical honesty can involve bringing together different stakeholders across your value chain to discuss an issue that is important to your sector. Toward the end of the aforementioned event, someone asked a rather poignant question: "Can purpose be too big if you can’t achieve it?" No. That is precisely the point of having a purpose, to propel you forward. However, a purpose can be too generic – and that is where brands and business are missing out. Kathleen Enright is the deputy managing director of Salterbaxter for EMEA. Salterbaxter, which is part of MSL, is a leading international sustainability consultancy that creates big ideas to inspire and deliver the necessary step change towards businesses that are simply sustainable.